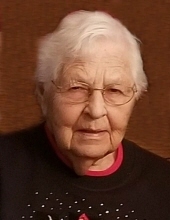 Adeline (Roehrig) Stephany, 94, of Pipe, Wi, passed away at home on March 28, 2019. Adeline was born on June 10, 1924 to Erwin and Edna Roehrig. Adeline graduated from St. John the Baptist Elementary School and then from Fond du Lac High School. She was united in marriage to Ralph Stephany on October 23, 1945 at St. John the Baptist Church. Adeline enjoyed spending her time gardening, sewing, doing needle work, baking, cooking, playing cards dancing, and birdwatching. Adeline gave of herself in many ways including; German American Club, St. John the Baptist Altar and Rosary, she volunteered for Red Cross blood drives, R/S Vintage Steel, and as an aide to the Teachers of Consolidated Parochial Elementary Schools. Adeline was preceded in death by loving husband, Ralph; two sons, Michael and Ronald; grandson, Adam, granddaughters, Cindy, Holly and Eve her parents, Erwin and Edna; and siblings, Gladys Abler and Lloyd Roehrig. She is survived by, children; Rose Ann (Jim) Braun, Kathy (Bill) Bartel, Steve (Tammy) Stephany, John (Leslie) Stephany; daughter-in-law, Sandy Stephany; grandchildren, Christopher, Michael, Carla, Mary, Carolyn, Allan, Matthew, Emily, Kelly, Daniel, Nina, Amanda, Doug, Luke, Duncan; 18 great grandchildren; sister, Alice Stenz; sister-in-law, Rose Roehrig. Services: Visitation will be on Wednesday, April 3rd, from 3:00 to 6:00 pm at St. John the Baptist Catholic Church, N8794 Cty Rd W, Malone, WI 53049, followed by a Mass of Christian Burial at 6:30 pm. Burial will be at St. John the Baptist Church Cemetery. "Email Address" would like to share the life celebration of Adeline Della Stephany. Click on the "link" to go to share a favorite memory or leave a condolence message for the family.